There are altogether 800 varieties of figs in all over the world and they mainly scatter in tropical and sub-tropical areas. China has more than 100 varieties of figs, Yuannan has 67 varieties, and Xishuangbanna has 48 varieties. Ficus plants mainly scatter in the rain forests and they are critical species in the rain forests. There are many strange phenomena with figs, such as "board-like roots", "flowers in old stalks", "garden in the air", and "strangling phenomenon" etc. These scenes are strange and mighty and reflect the important features of the rain forests. Some figs varieties are deemed as "holy trees" or "Buddhist trees" by local folks, and they formed a special fig culture there. The Garden of figs was constructed based on the importance and necessity of figs in the ecological environment in rain forests of South Yunnan, as well as their fantastic scenes, rich national cultural contents and for the purpose of protection of species in danger. The garden occupies an area of about 1 hectare, and it gathers nearly 60 varieties of figs ever since its establishment in 1993. Based on the ecological features of the figs, the garden is divided into three quarters: the quarter of strangling figs, the quarter of figs growing from ground and the quarter of figs culture. of them, lofty fig (Ficus altissima B1)、willow fig tree (Ficus benjamina Linn)、sacred fig (Ficus religiosa Linn. 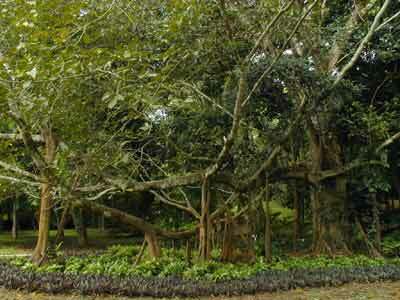 )、Ficus curtipes Corner 、eared strangler fig (Ficus auriculata Lour) have formed special scenes such as "tower packed by figs", "the fig corridor", and "one-fig forest" etc., and they make the tourists enjoy their special charm in the rain forests.